While there are many ways to get rid of unsightly tree stumps that will occasionally surface with every tree cut down, stump grinders remain a favorite for homeowners and professionals who will usually stop at nothing to maintain a neat looking yard. Available in various designs, these machines come with a cutting wheel or blade that progressively crushes away the wood leaving behind dust and debris. They are preferred for their fast, effective and safe working mechanisms not to mention the friendliness to the environment and instant results production. If you are looking to getting one of your own, there are plenty options in the market. However, the process of selecting the most suitable model can be overwhelming given the avalanche of features that you need to consider to get something that will perform efficiently at a fair price. With this buying guide, we have highlighted some of the considerations that will help you make the right choice. Similarly, we have listed some of the best picks in the market that can allow you achieve desired results. In as much as cutting down a tree that grew in a tight corner or corridor in your compound presents no problem grinding away the remaining stump after you are done with the trunk and branches is no touch and go affair. This is mainly because tackling the remnant in such tight spaces becomes tricky because most grinders cannot access them. However, with the Greatbull Walk behind stump grinding machine you got a compact working partner that can reach the seemingly unapproachable spots. The Greatbull walk behind power grinder stands as a reliable workhorse for its power, durability, and compelling unit features. It runs on a 14 horsepower Kohler gas engine that allows the user to hit the target expeditiously. The powerful engine is probably its greatest strength because with the immense power produced no matter how hard the stumps get no part is left protruding at the end of the day. The massive grinding strength of the motor is underscored by the 12 inches diameter cutting wheel that is fitted with nine cutter teeth. 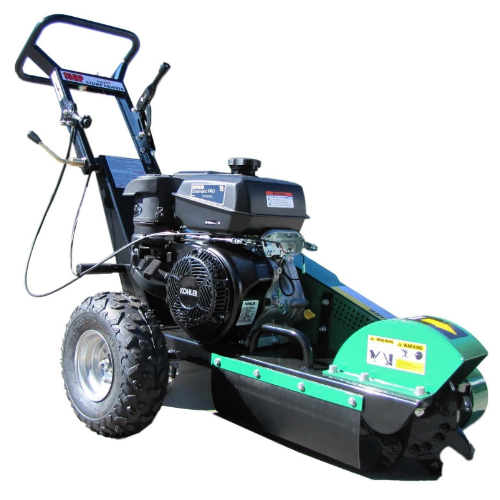 When it gets down to the job not only does it have the sturdiness and great grinding power for the hard and soft stubs alike but it can drive through commonly sized stumps. The cutter teeth are uniquely designed to lower the possibility of kickbacks for a free flow operation. Besides the cutting engineering, it is belt driven so at every point of operation this machine will always have the potency to deliver quality results. To facilitate hassle-free use and control, the Greatbull stump grinder features a hand brake and a clutch system. It is also equipped with a user safety stop switch which allows you to end operation as soon as the need arises. The combination of efficient operator features means managing this machine is presents no difficulty. As such, whether you are a seasoned user or have no experience at all you can learn and effectively use it as soon as you have it in your possession. As hinted above, the Greatbull shines as one of the leading market favourites for its highly mobile design. Its pneumatic tires can maneuver all the problematic terrains and narrow access ways among other tight spots. When it gets to loading and unloading you can always lift it with a little help. If you have tree stumps littering your compound in all the hard to reach places, the Greatbull stump grinder is more than capable of taking the challenge considering its blend of optimized features. With the kind of power it produces and the outdoor design, it remains in a pole position to tackle all manner of stumps thrown its way. At its price tree, stumps should not be a hindrance to your quest for a smooth landscape. The Toro 22602 stump grinder is another exceptional performer on our list that combines safety, strength, and sharpness to enable handling of minor stump removal jobs around the home and otherwise. As a product of an accomplished brand, this model has been built with enticing features that will leave you asking yourself why you didn't get it earlier. Packed with incredible features that set it apart from mediocre alternatives that you may come across in the market, there no question on the quality of results you will get by using this machine. 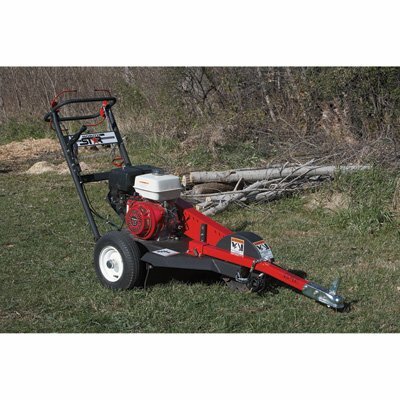 This stump grinder operates on a Honda GX390 13HP motor that is reliable enough and will yield adequate power that can allow crushing any stump blocking its way. Being a Honda-made engine, you are guaranteed a long lifespan in operation with less probability of breakdown. The cutting capacity pretty much determines the difference between an ordinary grinder and an exceptional one. In this sense, the Toro 22602 is bountifully endowed. It comes fitted with Tungsten Carbide tipped quadrublade that anchors 12 teeth for the ultimate cutting experience. The blade is accessibly positioned to allow quick reach in case the need to sharpen or replace it arises. 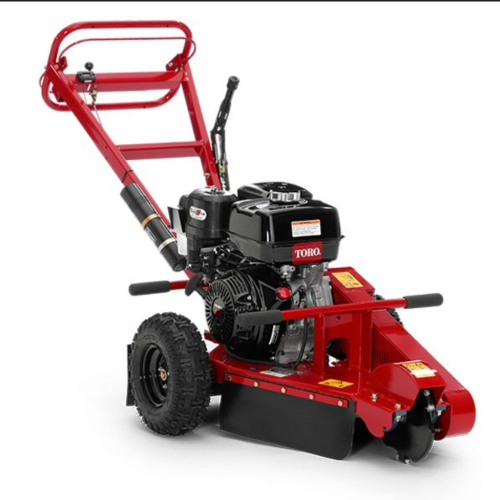 The Toro 22602 is designed to guarantee silent hassle free operation. Unlike some models that are just too noisy, this boasts of cool executions. Thanks to the rubber gaskets it is fitted in between the internal components the vibration is kept in check at bare minimum. While it is sizeable to finish the job to expectation, the dimensions are still modest enough, so most users won't find the size imposing. The grinder is engineered to allow seamless movement across the working area. With two back wheels that balance the unit and ergonomically designed handle not to mention conveniently stationed user controls, managing the workings of this machine is super simple. With this grinder, the nature of the terrain you are working on doesn't count. It can efficiently align to the realities of its working environment and eventually decimate any tree stump that stands on its way. By all means, this will save your time and energy, and when the work is settled, you will be happy that you invested in it. If you have long-desired a stump grinder to be proud investing on, the Toro Model 22602 is worth considering. At face value, it may appear basic, but once you try it out, you will be amazed at its power. As far as the cutting capacity is concerned this grinder relies on a 12 inches long cutting blade. The robust Tungsten Carbide made edge has 12 saw teeth and can pierce through to the depth of up to 12 inches. The cutting framework is supported by double V belt to ensure it remains steady at all times. Coupled with the fact that the overall makeup of the unit is also heavy-duty, the machine can quickly remove any stump on its path. Working with this stump grinder is so simple than you can ever imagine. It comes with a recoil starting system that can be ignited without encountering the slightest difficulty. And when it gets to exercising control, it boasts of a drum brake built to facilitate smooth stopping. As such, in case you need to halt operation in the middle or after the grinding is done the power to do so is in your hands. The Samson Machinery also features a strategic side discharge design which facilitates unhindered forward progress by directing the resulting cuttings off the path. Consequently, the cutting surface will remain free to advance translating to efficient execution. The grinder is affordable and can get going with minimal maintenance. It can help you remove stumps with easy much more than going manual. While it may not be the most portable, it is nonetheless moveable across the working space. Overall, this is a good buy especially for users looking for a model for typical home improvement tasks. The Holt Industrial HGW13 is a dependable stump removal grinder ideal for both residential and industrial applications. As a handheld machine, it is designed to complete associated stump grinding tasks quickly. Thanks to its functional design, this model will perform at the job site just like any other top of the line alternatives. Therefore, if you have that burning desire to re-write the landscape of compound by striking out remnants of trees that have been cut down, this is will help you work the magic. As a product from a respectable brand, the Holt Industrial HGW13 utilizes a 389cc Honda GX390 engine that delivers required power to steer the cutting wheel successfully through the trunk. The gas-powered motor produces up to 13 units of horsepower hinting at the ease and speed with which it runs. The larger than usual cutting wheel further evidences the agility of this machine. With a cutting head measuring 13 inches chewing through any wood presents not the slightest challenge. In any case, the additional breadth facilitates increased reach into the cutting range. And if you flex around with the slicing positions, the wider cutting arc can grind stubs of up to 10 inches in diameter. The grinder comes with tried, tested, and proven 12 green teeth. It means there is more than enough cutting surface that lands on the wood hence speeding up the grinding process. The operation is made more seamless by the 2 Band V-Belt cutter drive designed to facilitate smooth co-ordination. You will find this machine quite enjoyable to use because it is engineered to guarantee safety and comfort. It comes with a safety centrifugal clutch that which lets it stop immediately you let go. That way you can stay out of harm's way in case the unexpected happens. On matters comfort, you will find the adjustable handle quite useful as far as finding appropriate working positions is concerned. Although heavy at 370 pounds, handling this beast is not impossible. Coming with 15-inch pneumatic tires, it will roll over to the desired direction quite steadily. Also considering that it is less than 30 inches wide passing it through less spacious corridors won't be any problem. When it comes to lifting it either during loading or unloading from a vehicle the featured integrated handles and lifting hooks saves the day. Overall, the Holt Industrial HGW13 combines all the desirable features professionals and freestylers alike would love to see in their power tool. It is not only designed to provide one of a kind performance, but its price reflects the value one gets by buying a piece. When it comes to getting rid of stumps that have been lying idle in your compound for weeks, months or maybe years, it takes a first-rate machine to make things happen. And that is precisely what the House of Contractors guarantees with their HS-2000 model. Just by getting your hands on this machine, its sturdiness and inherent strength to deliver on the job become clear. Well, in some way this is built for that DIY guy who likes to do maintenance and home improvement tasks their way. This stump grinder by HOC is powered by a domineering Honda 4-cycle GX390 motor engineered to produce more power while burning less fuel. The heavy-duty engine rated at 13HP delivers sufficient firepower that is transmitted and takes effect through its reliably sturdy and easily rotated Tungsten Carbide cutting blade. The blade is designed with three independent edges thereby tripling the cutting surface for enhanced performance. Considering its ability to drive to the depth of up to 12 inches only sawdust will be left in its trail as it tears through the parts protruding above and that below the ground. At 254 pounds this beast is manageable. Whereas it will take some help to lift it up in case you need to load it into a vehicle for transportation, once on the ground pushing it around the working area is not strenuous at all. Practically any fit adult can use this machine just by reading through the user manual. If anything, it only takes getting the engine started, ensuring the blades are spinning, aiming the target and you can then walk over the stump in record time. The work is made easier by the emergency stop buttons and kill switch that allows you to come to a quick halt in case anything goes south. Similarly, the HS-2000 stump grinder comes with knobby tires that further ease maneuverability by creating higher stability. It is also worth noting that this stump grinder is quite sturdy, built to last but is at the same time comfortable to use. Going by its welded steel frame, there is more than enough guarantee that the machine can endure typical stump crushing tasks. The build further makes it less imposing. And given its adjustable handlebar working with this machine is quite pleasant. You can do with up to four height adjustments depending on the angle and stance that fits smooth operation. The Hs-2000 stump grinder is certainly a dependable pick for anyone looking for a model that is safe, easy to use, and moderately priced. With this, you will spend significantly reduced time and effort clearing stumps off your compound. The 15HPSG is another quality pick with some of the most of reliable features tailored for tree stump removal. With a high-value construction, user-friendly design not to mention the operator safety features it is supplied with there is no doubt that this machine is bound to provide expected results. The unit is powered by a 15 horsepower 420cc engine that produces up to 3600 rotations per minute. This is telling of what it can accomplish when you have some annoying stumps littering your yard. The power released when the system is cranked up is commensurate with most project demands for which homeowners and professionals may require such equipment. To ensure optimal power production and use the manufacturer armed this grinder with the OHV4 stroke system which works the magic as far as enhanced efficiency goes. The design provides for optimal power transmission as the crushing process progresses ensuring no bog down. It means every trickle of gas burned is put to best use saving you money in the long-run. And with its 12-inch 3.55 inches, this cutting wheel which comes ready with nine teeth, no old tree stubs and other fillers lying in your compound can stand in your way of gaining the flawless landscape. In the perfect working shape, it can grind through stumps measuring 20.25 inches tall and 9 inches below the surface without much ado. The beauty of the 15HPSG nonetheless stems from its relative ease of use. Coming with a recoil starting system, this unit will be up and running with the first pull. If you are just about to use this as the first stump grinder, rest easy knowing that it won't push you to the limits. Your comfort is guaranteed while using this device since it comes with a large pipe bow handle that is adjustable to help you maneuver the ground without straining. Otherwise, this grinder boasts of one of the most straightforward working mechanisms you can find in the market. Of course, clearing stumps can be a challenge to even the most experienced users therefore sometimes it takes confidence and more than knowing how to get the best of the machine. When it comes to safety, the 15HPSG comes equipped with an upgraded drum braking system. This allows the user to exercise firm control as it tears through leaving behind sawdust and debris. Again, it also features a special placed side discharge opening that facilitates seamless clearing of the dust and consequently avoids jamming of the cutting wheel. If you are struggling to decide on what grinder model to get in the hope of eliminating stumps from your compound, this makes the cut. At its price, it's worth your money. Given the specifications, you will save precious time and energy maintaining your yard for that peaceful look. The NorthStar GX390 is another fantastic pick if you have some stump grinding task that has long been pending on your to-do list. 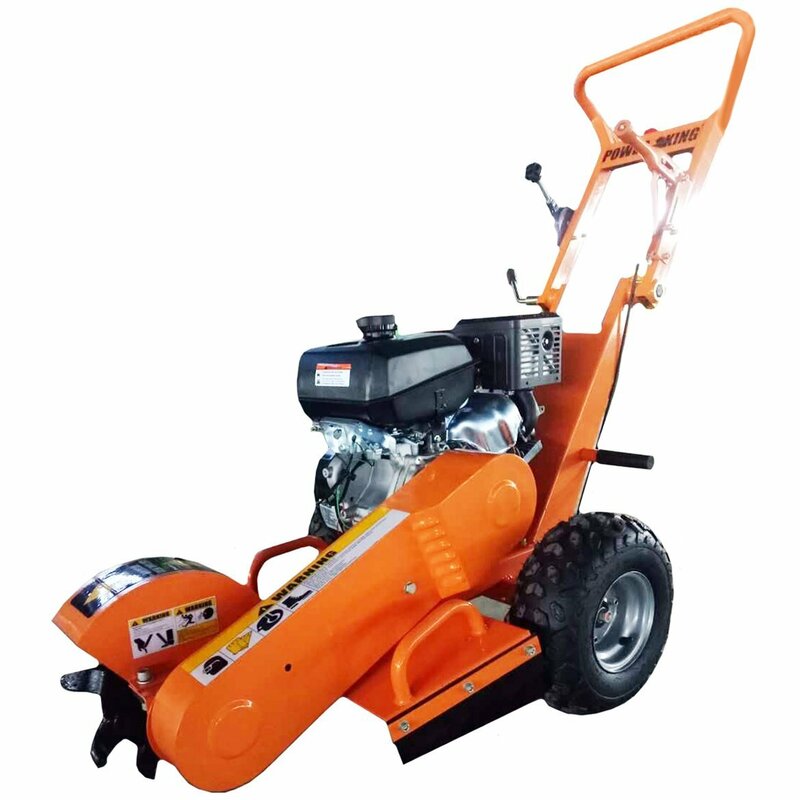 Engineered with a host of user-friendly features to allow fast and safe productivity, this grinder is all you need to get back that beautiful appearance that was lost when some trees in your compound had to be cut down hence the unsightly stumps. With this machine, you do not need a dozen pair of hands to eliminate several root trunks as may be in the case of manual digging. The number one reason why this model by NorthStar is a good pick stems from its powerful nature that guarantees utmost efficiency in the course of the cutting process. Running on a GX390 Honda-made motor, the machine delivers adequate torque every step of the way allowing prompt and relentless execution. To support a steady and progressive operation of the engine, it is equipped with heavy-duty Gates banded belt and idler bearings. The inner engineering is built not only to ease harmonious functionality but also to facilitate superior performance. That way, users can enjoy reduced downtime and extended use. Given the incredible engine power, it follows that grinding teeth are also equal to the task. At face value they already appear mean enough. This is a good hint of the hidden abilities. Ideally, the teeth are designed to chew through stumps sized up to 24 inches. While it can go beyond that, anything bigger will take much more time. For a secure and smooth flow of the grinding process, the Northstar GX390 features a strategically positioned side-discharge frame that allows the free release of sawdust and debris. Consequently, the grinding wheel and surrounding surfaces remain clear of any obstructions at all times. At 300 pounds you may be forced to imagine that this is just another beast that requires more than one pair of hands to work with. Surprisingly, the dimensions make it smaller and compact. With its solid wheels, maneuverability will not be such a big issue. Of course, you will have to do with some help putting it into or off a vehicle in case you are transporting it to another location a reasonable distance away. Once on the ground however, you can pull or push it around at your convenience. There is also an optional tow-attachment which you can get to help you cover the ground without straining especially if the working area is quite sizeable. For first timers you have nothing to worry about operating this unit because by perusing user manual that is included you can become an instant expert. From the recoil starter system to regulation and shut down everything is quite practical. You only have to crank it up point the blades to the target point and watch it grind the dust away with minimal intervention from you. 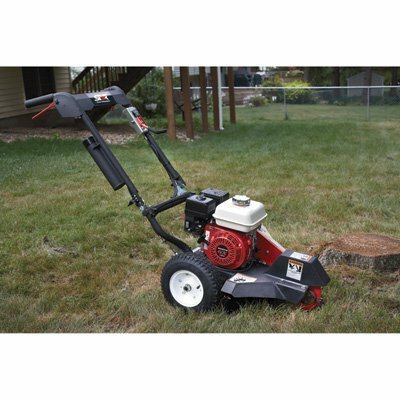 Overall, this stump grinder is well placed to help you complete typical stump grinding tasks properly and in record time. Considering its solid construction that is bound to last there is no doubt that the pricing is pretty reasonable. The NorthStar brand boasts of an unparalleled reputation as far as the production of exceptional tools is concerned, and the 160cc Compact stump grinder is not any different. A product that is crafted and tested to meet high-level specifications in line with consumer needs, the NorthStar Compact stump grinder is a real beast capable of performing a wide range of stub crushing jobs around the home among other places. 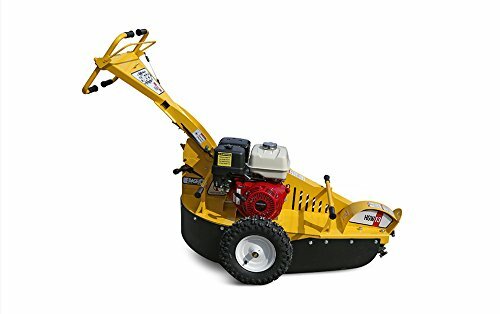 Regardless of the toughness of the tree stump in question, this machine can help you get rid of them without straining your muscles or scratching your fingers even by the slightest touch. Here is why this grinder is one of the best picks. The NorthStar grinder stands as one of the most efficient models in the market thanks to its high output engine. The superior grade Honda GX160 that runs the unit allows excellent execution of cuts by producing proportionate power as the intensity of the task at hand demands. 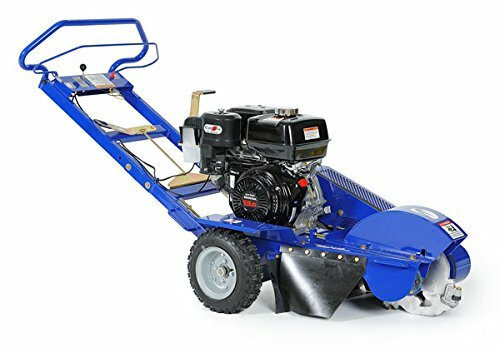 The powerful punch it emits during the crushing process is sufficient to complete the work quickly so you won't have to allocate a whole day clearing a few stumps degrading your yard. Unlike other models that may leave you frustrated for their lack of adequate firepower, this is incredibly strong. This Compact stump grinder by NorthStar is also highly recommended for its cutting capacity. Coming with 9 2/3 inches diameter by 3/8 inches cutting wheel anchoring four carbide-tipped teeth, it can adequately handle typical tree remnants without any hiccups. In reality, it can grind stumps ranging from 10 inches above the ground to 9 inches below the surface telling of its unquestionable ability. While it takes a little learning to use this machine productively, you do not prior experience to work your way on how to use it comfortably. It is easy to start, control, and stop thanks to the user-friendly design that enables the operator to keep every action in check. It means the machine remains safe at every point of use because no matter what happens the user can react accordingly. 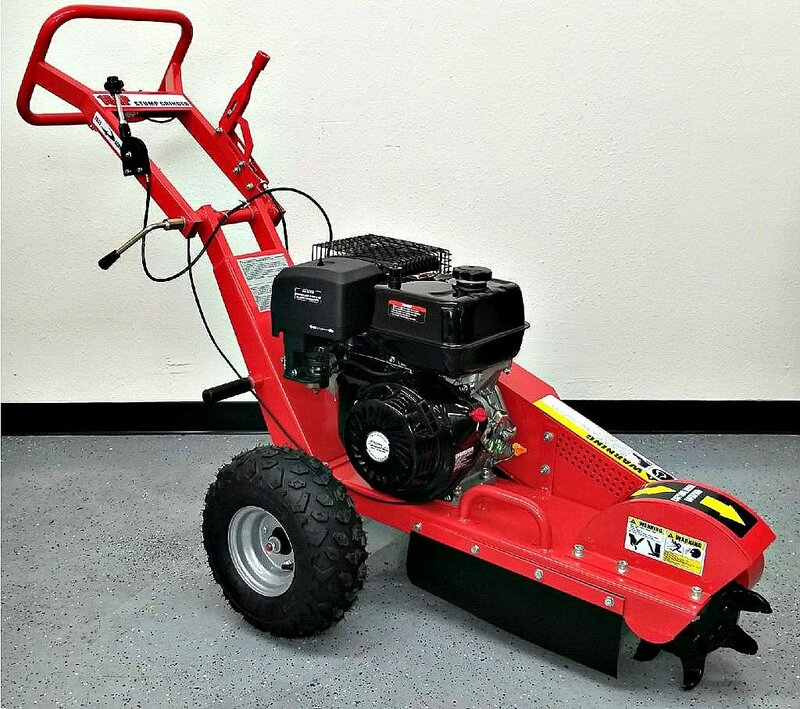 Besides, at 135 pounds this is one among the few considerably compact, lightweight, and highly portable stump grinders you can find in the market. You can move it around from one location to another in a car unlike others which requires nothing short of a pick-up truck. The small size is also advantageous when it comes to accessing thin paths. Maneuverability is quick and smooth even for the stump that may be located at very tight edges such as next the fence. Furthermore, the handles can also get folded hence fitting it in small spaces such as doorways when passing or during storage. Another exciting feature that earns scores for this grinder has to be the side discharge design that releases the resulting sawdust and debris. Most machines do not have such a luxury feature hence mostly let the dust fly in every direction. With this model the risk of such emission getting right into your eyes is eliminated so you can work uninterrupted because your vision will always be clear. Moreover, the debris goes away from the wheel and teeth meaning advancing into the stump will not be compromised in any way so you can work uninterrupted. If you have been looking for a reliable stump grinder, look no further because the NorthStar Compact is good enough at its price. Not only does it offer sufficient power but it is also compact and highly maneuverable. While it looks smaller as compared to many other alternatives of equal standing it is nonetheless a real workhorse. When it comes to maintaining a beautiful lawn, getting rid of stumps once trees that are longer needed in the yard are cut remains a top priority for many people. Considering how the traditional way to this end remains exhausting, getting an excellent tool in place of the shovels and axes is a much quicker and efficient way to rid your compound of unsightly tree stubs. If you are thinking about a dependable quality stump grinder, the Bluebird SG314B could be what you need to evade the manual back-breaking process. This stump grinder is equipped with an array of features geared towards facilitating fast and masterly removal of tree remnants. To begin with, the Bluebird stump grinder boasts of a heavy-duty recoil starter that allows smooth switching on, so you never have to think twice about getting down to work. The starter is purposely designed to enable effortless beginnings. Accordingly, new and seasoned users can embark on any stump grinding projects without the slightest hesitation. 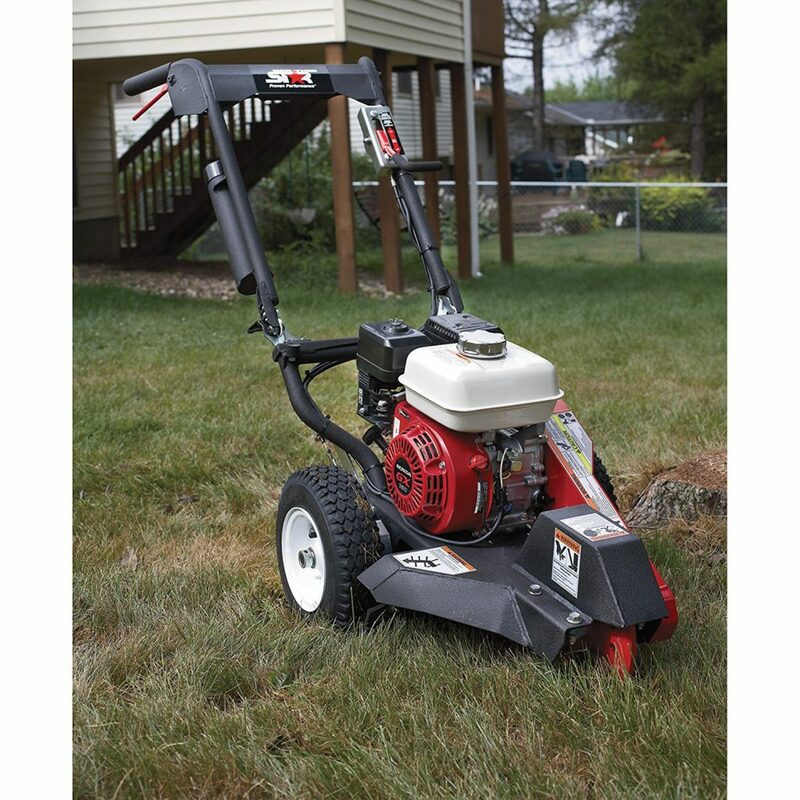 Further, this grinder comes with gas-run 13HP/389cc Honda 4-cycle OHV engine designed to offer optimal performance. The motor works quietly but still provides adequate power to get the job done. The OHV engine design ensures increased overall efficacy and optimal power transfer as the intensity of the job demands. And there is more because the engine is also fitted with a cyclone air filter which allows adept fuel combustion. It means this grinder will consume less fuel while still producing enough power to run the machine. In the long-run, you can accumulate huge savings on fuel expenses which is undoubtedly a good thing. As far as ensuring steady and rapid power supply is concerned, the Bluebird SG1314B comes loaded with an automatic Noram centrifugal clutch. The connection serves to guarantee enhanced and consistent power delivery such that no matter how tough the stump may be you have sufficient firepower to grind through every inch of the wood. The feature essentially grants the freedom to keep a desirable working pace so users can always manage their tasks with confidence. Apart from the features above, another huge selling point of the Bluebird SG1314B stump grinder is the M1 cutting technology. Utilizing 14 inches by 3/8 inches cutting wheel, this machine comes with Carbide-tipped teeth with each set of the dentition featuring three cutting edges. The unique threefold teeth triple the cutting action and hence ensures quick completion of a stump grinding work. Coupled with the fact that the teeth are quite sharp and can reach a variable depth of up to 12 inches, there is no doubt that this tool can help you clear stubs quickly without consuming much of your energy. And when dust and debris are flying around, the guard around the cutting wheel will keep them from getting into your eyes. On matters safe and comfortable operation, you will be glad to know how this stump grinder is optimized to guarantee hassle-free use. The Bluebird SG1314B features a Hayes lever-activated disc brake inherently designed to give the user maximum control while operating the machine. Whether it stays put in motion or goes off-track, you can always bring it to an instant halt before you can make appropriate adjustments. Furthermore, the Bluebird comes with a compact makeup and clear sight lines that makes maneuverability around tight spaces no big deal. Besides it moves on 12-inch pneumatic knobby tires which allows greater stability hence pushing the unit around becomes smoother. The Bluebird SG1314B is not complete without the ergonomic handle design that is both friendly to the hands and body posture. The handle can be adjusted to four different settings so you will not have to strain your back or hands to keep the machine in control. Depending on the level of the stump and the angle of inclination you can always fix the grip in line with your needs. Although it takes a reasonable budget to get this device, it remains a good pick for anyone interested in a durable tool that can grind deeply rooted stumps. It is not only efficient, but it is also ergonomic and safe for all your stump removal projects. Every homeowner desires to have a neat compound characterized by a smooth landscape and lush lawns. In some cases to achieve this, it calls for the cutting of unwanted trees in the yard. After sawing down such trees and hauling away the resulting logs and branches, one is left with unshapely stubs that work against the desire to actualize a beautiful courtyard. The good news is that with the Powerking stump grinder you can square the problematic remnants and eventually put your compound in the perfect order. And here is why this is the go-to tool as far as getting rid of stumps is concerned. 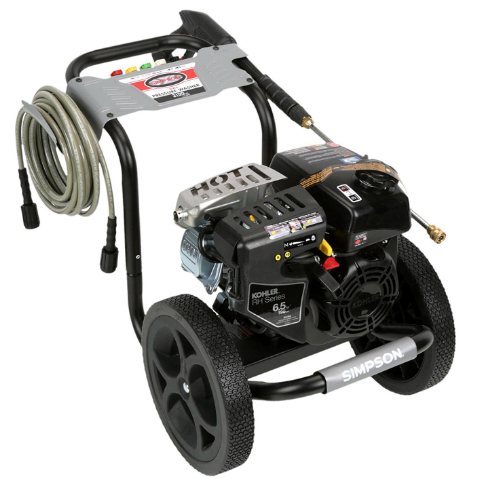 First and foremost, the Powerking comes with a breathtakingly powerful motor. The 14 horsepower Kohler motor generates sufficient firepower that can effectively and safely grind through the stump without bogging down. Whether hardwood or softwood nothing can come in the way of this grinder. The motor is also built to last so you can expect years of service with no significant hiccups at all. Having in mind how tricky stump grinding can be, the manufacturer of this machine went out of the way to ensure the process is made much more straightforward. Designed to work both below and above the ground, the Powerking stump grinder can systematically crush the remaining tree stalks of up to 20 inches over the surface and 9 inches below the surface. This tool is nothing like most average alternatives. With nine high flying blades each measuring 12 by 3.5 inches, grinding out stumps can never be any easier. The Tungsten-made edges are not only sturdy but are also lightweight to allow smooth handling on the job. The combined power of the blades provides for quick and efficient cutting, so regardless of the kind of stump you want to eliminate the odds will be on your side and your desires can always prevail. Concerning operations, the Powerking features a one pull start that allows the user to get to work effortlessly. Unlike other machines plagued by problems of getting the engine running, in this case, it only takes a single pull on the starter string, and you can get going. And thanks to the quality build dual bolt design locking throttle, and disk brake drum that is also featured on this grinder keeping the functions in check is quite a piece of cake. The throttle is designed to lock into place at a chosen speed while the brake drum will allow execution of instant sharp turns and pivot cuts in every desired direction. This blend of features frees both hands to allow smooth control and maneuvers. Similarly, this tool comes with a double shut down feature which gives the operator maximum control over the unit. Considering how risky using such a machine can be, the Powerking is equipped with a slap stop button and a shut-off pull latch which allows quick switch off in case the device seems overpowering or is deviating from the right course. In essence, user safety is guaranteed, so the first time and seasoned users have an equal chance of utilizing the stump grinder satisfactorily. It also comes with a large pip bow handle that guarantees maximum comfort especially for long hours of sustained use. The strategically placed ergonomic handle makes it easy for the operator to hold and guide the grinding process without tiring out. The ability to make adjustments grants even more secure and steady grip control. While it is difficult to say that this kind of machine is lightweight, as compared to other picks of its class the Powerking remains manageable on the ground. At 396 pounds and with dimensions of 42 by 51 by 72 inches it might be bulky but can nonetheless be pushed around easily which is a pretty good thing. Whereas the weight is optimized to provide the toughness required for the job, it is also ideal to allow access to all the tight spots. In as much as it calls for a fit person to use this machine, its reliability is something worth counting on nonetheless. If you have some unattractive tree stumps in your compound that you want to do away with quickly, this option is one workhorse that can get the job done. With its power and dependability not to mention the reasonable pricing, it's totally worth acquiring. The complexity and general nature of the job you will be using the machine on should be among the first things that should come to your mind when shopping for a stump grinder. 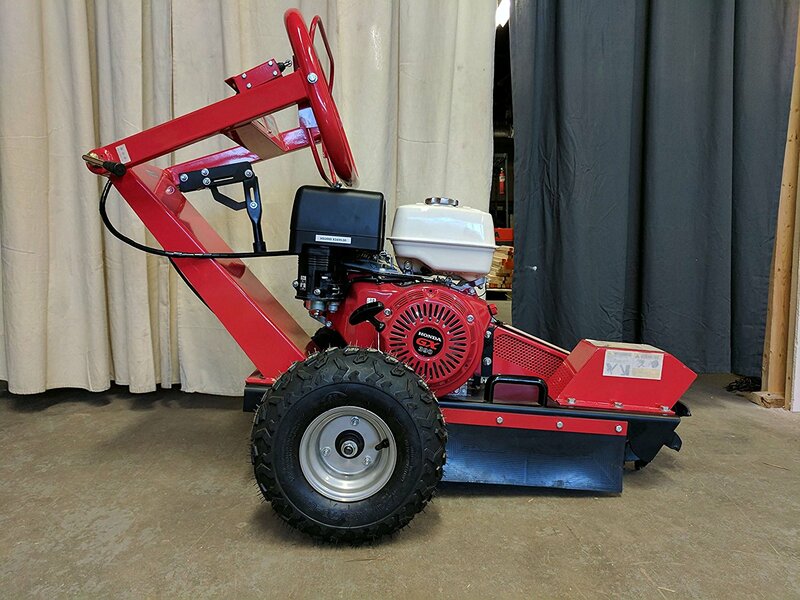 In the market, you will find models fit for routine industrial scale stump grinding projects and others that are best suited for occasional home maintenance projects. It won’t make any sense if you buy a massive model for small-scale jobs and vice versa. Finding the perfect balance goes a long way in ensuring you spend your money on the ideal tool. The productivity of a stump grinder will significantly depend on the cutting wheel, the blade, the teeth, and their suitability to land on the stump effectively. An ideal model, therefore, should have strong and sufficient cutting edge mechanism. You should look out for the cutting depth you will be able to execute both over and below the ground. That way you can get something that is adequately equipped in line with the size of the tree remnants you will be clearing. If there is one reason why people use machines, it should be the hassle-free productivity that such units bring to the job site. This should be no different with the best stump grinder for the money. An efficient model should be designed to make your work easier during operation and not complicate things. The first determinant of how efficient a machine will be is the engine capacity and the power strength. It is advisable that you should pick a model that produces commensurate torque in line with the intensity of your work so you can minimize the chances of the unit being bogged down. Again, look out for easy start, control, and braking features because these are important in giving you maximum control during the grinding process. also pay attention to the specifications maneuvering to avoid disappointments in the future. Your safety should always come first if you are to achieve the results. Whether it’s about professional tasks or for typical home maintenance, it pays to pick a grinder optimized to guarantee your wellbeing at all times. Therefore, during the selection process strive to choose a model that comes with features such as wheel guards that can prevent debris from flying across your face and automatic break buttons or stop switches to allow quick stoppage in case of emergency. Also, try to identify any flaws in the design that may expose you to danger before making a purchase. Stability of the wheels and the sturdiness of the handle frame at this point become quite crucial. It won’t be possible to work peacefully with a stump grinder if the working position is awkward and exhausting. 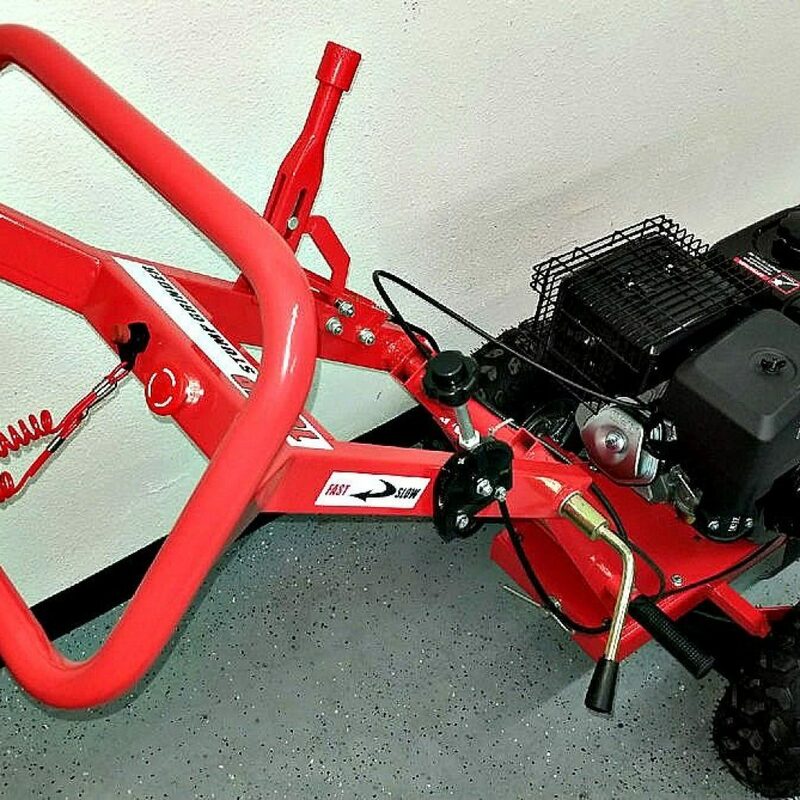 Therefore, in your search for the best stump grinder check out for a soft touch and adjustable handlebar that can be adjusted to various positions with changing positions of the stumps and terrain. The working mechanism of an ideal pick should also call for minimal intervention from the operator. Q: Why are stump grinders preferred over other methods say chemical removal or manual digging? A: Unlike other methods stump grinders provides almost instant results. While you may have to labor for a whole day to remove a single stump or wait for weeks before the chemical can soak up a stump, using a grinder takes significantly less effort. Besides, it intrudes less on your landscape. Q: How can I know the best grinder for the money? A: It takes a reasonable budget to purchase a quality model that will last. Nonetheless, it is not a must that you spend top dollar to get the best deal. The best way around it would be to strike a balance between the features that are likely to work for you and the amount you are comfortable spending. Stump grinders are fantastic pieces of machinery to own especially if you have to undertake occasional stump removal jobs. The reliability of the various models available in the market crucial is for maintaining neat yards around the home and in other living and recreational areas. To enjoy the value of your money, paying attention to the capacity, efficiency, and performance-enhancing features is vital.